The Almanach de Gotha was a directory of Europe's royalty and higher nobility, also including the major governmental, military and diplomatic corps, as well as statistical data by country. First published in 1763 by C.W. Ettinger in Gotha at the ducal court of Frederick III, Duke of Saxe-Gotha-Altenburg, it came to be regarded as an authority in the classification of monarchies and their courts, reigning and former dynasties, princely and ducal families, and the genealogical, biographical and titulary details of Europe's highest level of aristocracy. It was published from 1785 annually by Justus Perthes Publishing House in Gotha, until 1944 when the Soviets destroyed the Almanach de Gotha's archives. In 1998, a London-based publisher acquired the rights for use of the title of Almanach de Gotha from Justus Perthes Verlag Gotha GmbH. Perthes regard the resultant volumes as new works, and not as a continuation of the editions which Perthes had published from 1785 to 1944. Two volumes have been printed since 1998, with Volume I containing lists of the sovereign, formerly sovereign and mediatised houses of Europe, and a diplomatic and statistical directory; and Volume II containing lists of the non-sovereign princely and ducal houses of Europe. The original Almanach de Gotha provided detailed facts and statistics on nations of the world, including their reigning and formerly reigning houses, those of Europe being more complete than those of other continents. It also named the highest incumbent officers of state, members of the diplomatic corps, and Europe's upper nobility with their families. Although at its most extensive the Almanach numbered more than 1200 pages, fewer than half of which were dedicated to monarchical or aristocratic data, it acquired a reputation for the breadth and precision of its information on royalty and nobility compared to other almanacs. The Almanach's publication by Justus Perthes began at the ducal court of Saxe-Coburg and Gotha in Germany and, its reigning dynasty was listed first therein well into the 19th century, usually followed by kindred sovereigns of the House of Wettin and then, in alphabetical order, other families of princely rank, ruling and non-ruling. Although always published in French, other almanacs in French and English were more widely sold internationally. The almanac's structure changed and its scope expanded over the years. The second portion, called the Annuaire diplomatique et statistique ("Diplomatic and Statistical Yearbook"), provided demographic and governmental information by nation, similar to other almanacs. Its first portion, called the Annuaire généalogique ("Genealogical Yearbook"), came to consist essentially of three sections: reigning and formerly reigning families, mediatized families and non-sovereign families at least one of whose members bore the title of prince or duke. The first section always listed Europe's sovereign houses, whether they ruled as emperor, king, grand duke, duke, prince (or some other title, e.g., prince elector, margrave, landgrave, count palatine or pope). Until 1810 these sovereign houses were listed alongside such families and entities as Barbiano-Belgiojoso, Clary, Colloredo, Furstenberg, the Emperor, Genoa, Gonzaga, Hatzfeld, Jablonowski, Kinsky, Ligne, Paar, Radziwill, Starhemberg, Thurn and Taxis, Turkey, Venice and the Order of Malta and the Teutonic Knights. In 1812, these entries began to be listed in groups. First were German sovereigns who held the rank of grand duke or prince elector and above (the Duke of Saxe-Gotha was, however, listed here along with, but before, France—see below). Listed next were Germany's reigning ducal and princely dynasties under the heading "College of Princes", e.g., Hohenzollern, Isenburg, Leyen, Liechtenstein and the other Saxon duchies. They were followed by heads of non-German monarchies, i.e. Austria, Brazil, Great Britain, etc. Fourthly were listed non-reigning dukes and princes, whether mediatized or not, including Arenberg, Croy, Furstenberg alongside Batthyany, Jablonowski, Sulkowski, Porcia and Benevento. In 1841 a third group was added to those of the sovereign dynasties and the non-reigning princely and ducal families. It was composed exclusively of the mediatized families of comital rank recognized as belonging, since 1825, to the same historical category and sharing some of the same privileges as reigning dynasties by the various states of the German Confederation; these families were German with a few exceptions (e.g. Bentinck, Rechteren-Limpurg). The 1815 treaty of the Congress of Vienna had authorized — and Article 14 of the German Confederation's Bundesakt (charter) recognized — retention from the German Imperial regime of equality of birth for marital purposes of mediatized families (called Standesherren) to reigning dynasties. The almanac added a third section consisting exclusively of mediatized families of comital rank. In 1877, the mediatized comital families were moved from section III to section II A, where they joined the princely mediatized families. For the first time in the century of its existence, the largely non-German, un-mediatized princely and ducal families of the Almanach de Gotha were removed from the same section as other non-reigning families bearing princely titles. While non-mediatized German and Austrian families (e.g. Lichnowsky, Wrede), were likewise relocated from the almanac's second to its third section, the second section's new preponderance of German families, princely and comital, which were henceforth recognized as possessing the exclusive privilege of inter-marriage with reigning dynasties was salient: Excluded were members of such historically notable families as the Rohans, Orsinis, Ursels, Norfolks, Czartoryskis, Galitzines, La Rochefoucaulds, Kinskys, Radziwills, Merodes, Dohnas and Albas. Although theoretically mediatized families were distinguished from Europe's other nobility by the former status of their territories as Reichsstand and their exercise within the Holy Roman Empire of "semi-sovereignty" or imperial immediacy (Reichsunmittelbarkeit), many Standesherr families, especially those bearing the comital title, had not been fully recognized as legally possessing immediate status within the Empire prior to its collapse in 1806. No other families whose highest title was count were admitted to any section of the almanac. Moreover, other deposed European dynasties (e.g. Arenberg, Biron, Dadiani, Boncompagni-Ludovisi, Giray, Murat) did not benefit vis-a-vis the almanac from a similar interpretation of their historical status. Many princely or ducal families were listed only in its third, non-dynastic section or were excluded altogether, evoking criticism in the 20th century from such genealogists as Cyril Toumanoff, Jean-Engelbert, Duke d'Arenberg and William Addams Reitwiesner, the latter commenting that the changes displayed "pan-German triumphalism" and even a "fairly nasty bit of Germanic chauvinism." Monsieur de Champagny, this year's "Almanach de Gotha" is badly done. First comes the Comte de Lille [title used in exile by Louis de Bourbon, Count of Provence -- future King Louis XVIII of France], followed by all the princes of the Confederation as if no change has been made in the constitution of Germany; the family of France is named inappropriately therein. Summon the Minister of Gotha, who is to be made to understand that in the next Almanach all of this is to be changed. The House of France must be referred to as in the [French] Imperial Almanac; there must be no further mention of the Comte de Lille, nor of any German prince other than those retained by the Articles of Confederation of the Rhine. You are to insist that the article be transmitted to you prior to publication. If other almanacs are printed in my allies' realms with inappropriate references to the Bourbons and the House of France, instruct my ministers to make it known that you have taken note, and that this is to be changed by next year. The response of the publishers was to humour Napoleon by producing two editions: one for France, with the recently ennobled, and another which included dynasties deposed since abolition of the Holy Roman Empire. A merged version, whose first section including recently reigning dynasties but also families which lost sovereignty after the fall of Napoleon in 1815, remained in publication until 1944, and has been replicated in subsequent dynastic compilations (e.g., Genealogisches Handbuch des Adels, Fürstliche Häuser, Le Petit Gotha, Ruvigny's "Titled Nobility of Europe"). In 1887 the Almanach began to include non-European dynasties in its first section, with the inclusion of one of the ruling families of India. When Soviet troops entered Gotha in 1945, they systematically destroyed all archives of the Almanach de Gotha. In 1951 a different publisher, C.A. Starke, began publication of a multi-volume German-language publication entitled the Genealogisches Handbuch des Adels (GHdA). The publication is divided into subsets; the Fürstliche Häuser subset is largely equivalent to the German language Gothaischer Hofkalender and its Fürstlichen Häuser volume which was also published by Perthes, or sections 1, 2 and 3 of the Almanach de Gotha. However, no single volume of the Fürstliche Häuser includes all the families included in the Hofkalender or Almanach de Gotha. It is necessary to use multiple volumes to trace the majority of European royal families. 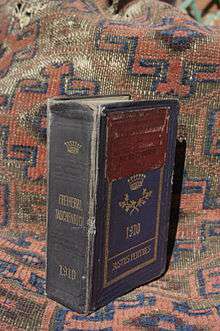 In 1989 the family of Justus Perthes re-established its right to the use of the name Almanach de Gotha. The family then sold these rights in 1995 to a new company, Almanach de Gotha Limited, formed in London. The new publishers launched with the 182nd edition on 16 March 1998 at Claridge's Hotel. It was written in English instead of French as the editor felt that English was now the language of diplomacy. Charlotte Pike served as editor of the 1998 edition only and John Kennedy as managing director and publisher. The new publishers also revived the Committee of Patrons under the presidency of King Juan Carlos I of Spain and chairmanship of King Michael I of Romania. The London publisher produced a further four editions of volume I (1999, 2000, 2003 and 2004) based on the 1998 edition of volume I which include Europe's and South America's reigning, formerly reigning, and mediatised princely houses, and a single edition of volume II in 2001 edited by John Kennedy and Ghislain Crassard which include other non-sovereign princely and ducal houses of Europe. A review in The Economist criticised the low editorial standards and attacked volume II for a lack of genealogical accuracy. After a gap of eight years a new edition of volume I was published in 2012 under the editorship of John James. A review in The Times Literary Supplement praised the 2012 volume I for a "punctilious itemization of titles, lineage and heraldry [aiming] for scholarship rather than sensation...Some family legends – such as the Ottoman boast of descent from a grandson of Noah – do not merit inclusion in a work with authoritative aspirations. Most quixotically of all, the title page displays the word 'Annual', although it has been eight years since the last edition appeared." As it was the practice of the diplomatic corps to employ official titles, adhere to local precedence and etiquette, and to tender congratulations and condolences to members of the dynasty of the nation to which they were assigned, the almanac included a Calendrier des Diplomates ("Diplomats' Calendar") section, which detailed major national holidays, anniversaries, ceremonies and royal birthdates. Following World War I and the fall of many royal houses, fewer regulatory authorities remained to authenticate use of titles; however the Almanach de Gotha continued the practice of strict verification of information, requesting certified copies of letters patent, genealogies confirmed by competent authorities, documents, decrees and references for titles claimed. Europe's middle and lower nobility (families whose principal title ranked below that of prince or duke — except mediatized families, listed in a section of their own) were not included in the almanac. Nor were the grandees or ducal families of Portugal and Spain (where titles, being habitually transmissible through both male and female lines, were often inherited by relatives of non-patrilineal lineage). Families of some Italian and East European nations (e.g., Russia, Romania), where the princely title was claimed by many, were also incomplete. Yet the reigning, formerly reigning and noble families included in the almanac numbered in the hundreds by the time it ceased publication in 1944. In 1890 the almanac renamed II A to section II, and II B to section III. Dynasties ruling non-European nations were located in section I B. Families which became extinct were listed for the final time in the year following death of the last member, male or female, and subsequent editions referred readers to that volume. From 1927, the almanac ceased to include all families in each year's edition, henceforth rotating entries every few years. Where titles and styles (such as Serene Highness) had ceased to be recognized by national governments (e.g. Germany, Austria, Czechoslovakia), the almanac provided associated dates and details, but continued to attribute such titles and styles to individuals and families, consistent with its practice since the French revolution; deposed sovereigns and dynasties continued to be accorded their former titles and rank, but dates of deposition were noted, and titles exclusively associated with sovereignty (e.g. emperor, queen, grand duke, crown princess) were not accorded to those who had not borne them during the monarchy. Titles of pretence below sovereign rank were accorded to members of formerly reigning dynasties as reported by heads of their houses, otherwise self-assumed titles were not used. The almanac included an explicit disclaimer announcing that known biographical details, such as birthdates and divorces, would not be suppressed. ↑ "Almanach de Gotha". Justus Perthes. Retrieved 9 June 2008. 1 2 3 4 5 6 7 Almanach de Gotha. Justus Perthes, Gotha, 1944, pp. 7-12, 131, 169, 363-364, 558, 581-584. French. 1 2 3 4 5 6 7 8 de Diesbach, Ghislain (1967). Secrets of the Gotha. UK: Chapman & Hall. pp. 21, 23–24, 28–30. ↑ Fra Cyril Toumanoff, "Genealogical Imperialism" (1985) vol 6 (no 134) (NS) Coat of Arms pp. 145, 147. ↑ Duke and Prince Jean Engelbert d'Arenberg, "The Lesser Princes of the Holy Roman Empire in the Napoleonic Era" dissertation, Washington, DC, 1950, published as Les Princes du St-Empire à l'époque napoléonienne (Louvain, 1951) 15ff, quoted in Almanach de Gotha (Almanach de Gotha, London, 1998) pp. 275–286. ↑ Reitwiesner, William Addams (January 1998). "Mediatization". Retrieved 19 April 2011. ↑ Correspondance de Napoléon I. XVI. France: Imprimerie Impériale. 1864. Retrieved 6 July 2014. ↑ "The Modern Gotha". Almanach de Gotha. Archived from the original on 11 February 2006. Retrieved 30 May 2008. ↑ Runciman, Steven (2 May 1998). "The first book of kings". The Spectator. Retrieved 6 June 2008. ↑ "The Société des Amis de l'Almanach de Gotha". Almanach de Gotha. Retrieved 1 May 2014. ↑ Hardman, Robert (19 June 2001). "Family almanac will unmask the noble pretenders". Daily Telegraph. Retrieved 6 June 2008. 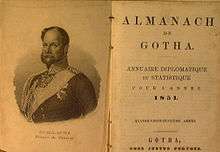 ↑ "The Almanach de Gotha -- Gothic horror". The Economist. 24 January 2002. Retrieved 7 October 2007. 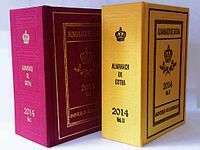 ↑ "Almanach de Gotha 2012. Volume I, parts I & II". Boydell & Brewer. Retrieved 8 February 2012. Diesbach, Ghislain de. Secrets of the Gotha. Meredith Press, 1964.